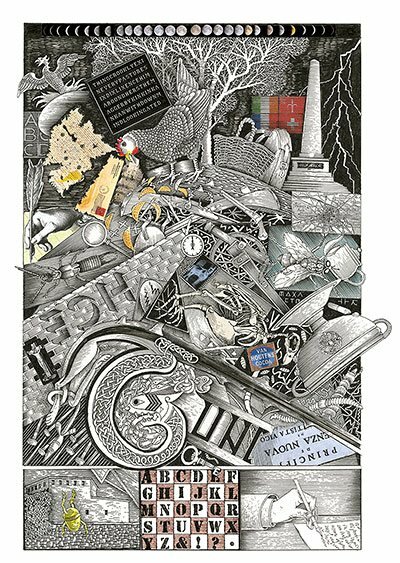 A new illustrated edition of Finnegans Wake, as imagined by artist John Vernon Lord for the Folio Society, matches James Joyce’s extravagant word games with elaborately collaged pictures, shedding a brilliant new light on Irish literature’s ‘book of the dark’. Here, Lord explains the thinking behind the images. The frontispiece illustration doesn’t apply to a particular chapter. Instead it connects loosely with quotations, which seem to me a description of Finnegans Wake itself, and the nature of writing: ‘if you are abcedminded, to this claybook, what curios of signs . . . in this allaphbed!’ and ‘it is not a miseffectual whyacinthinous riot of blots and blurs and bars and balls and hoops and wriggles and juxtaposed jottings linked by spurts of speed: it only looks as like it as damn it’. 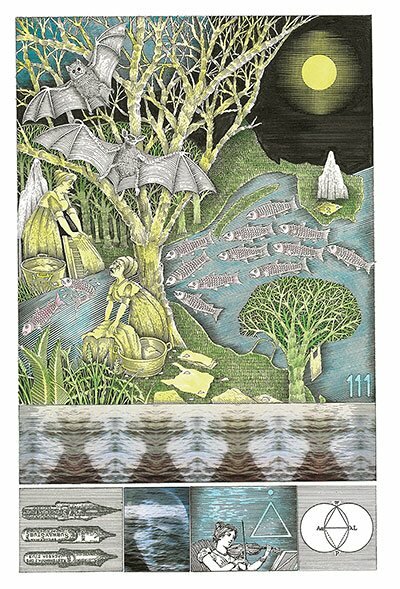 The illustration evokes my overall feeling about the book as being a ‘nightmaze’ and a ‘jungle of woods’. The word ‘alphabet’ is suggested in various ways throughout the text: ‘alphabetters’, ‘alphybettyformed verbage’, ‘alpheubett buttons’ and ‘alpha-bites’. 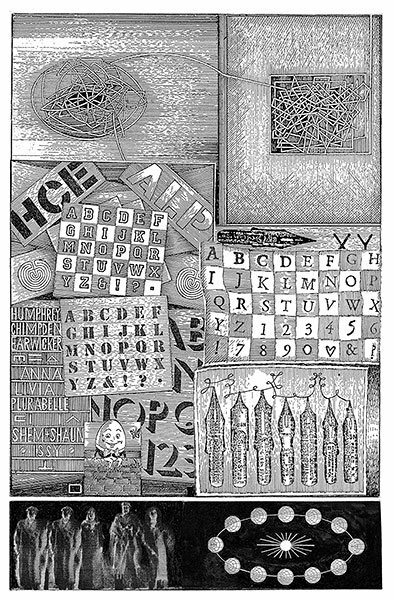 This illustration represents the alphabet (the instruments of language) and pen nibs (the instruments of writing), with an allusion to Shem the Penman and his alter ego, Joyce himself. 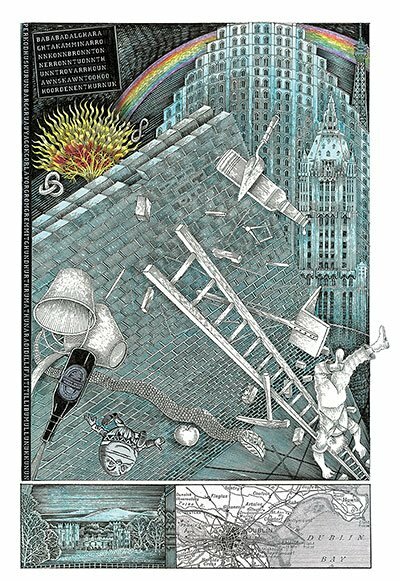 This illustration represents Tim Finnegan’s fall from a ladder while drunk, an episode based on the old vaudeville song about the Irish hod-carrier who plunges to his death from a building. In the wake that follows he is restored to life by a great splash of whiskey. Finnegan is to be supplanted by Earwicker, the dreamer of the book. The fall is symbolic of the falls of Lucifer, Adam, Napoleon and Parnell, and indeed the Fall of man. It is also the fall of Humpty Dumpty and Isaac Newton’s apple. An apple represents the fruit that the snake tempted Eve to eat. A ladder itself is symbolic of both falling and rising. Within a black square in the top left corner of the illustration we can ‘hear’ a thunderclap. This is the first of the ten 100-character words in the book representing thunder. The bottom left-hand image is a drawing of ‘Howth Castle and Environs’ referred to in the first line of the book. This is the encounter between Earwicker and the ‘cad with a pipe’. It is alleged in this ‘chapter’ that HCE behaved improperly in Phoenix Park, indecently exposing himself (behaving ‘with an ongentilmensky immodus’) in front of ‘a pair of dainty maidservants in the swoolth of the rushy hollow’. The cad tells his wife about HCE’s alleged lewd behaviour and his wife tells a priest over a cup of tea, who in turn tells a professor at the races, who lets everybody know about it. The all-seeing eyes among the trees, the pointing fingers and the four sets of mouths all represent this cycle of snooping, accusation, rumour and gossip about HCE. 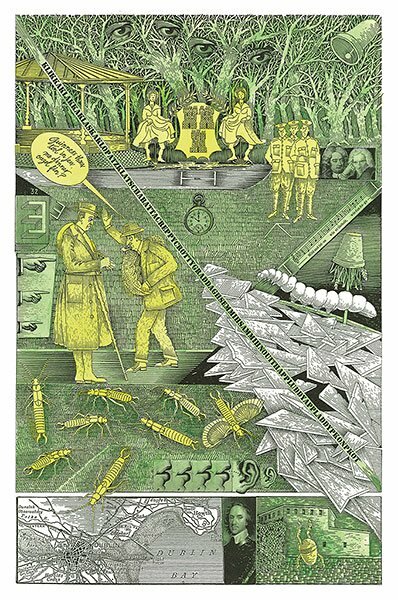 The ‘thunderword’ appearing diagonally across the illustration makes the sound of glass breaking, perhaps representing the collapse of Earwicker’s world. This illustration of a hen scratching among ‘a middenhide hoard of abjects’ is a version of Anna Livia Plurabelle. It seems as if the whole of the world’s existence is being brought out of the earth, foraging for a record of the past: ‘where in the waste is the wisdom?’ The process of writing seems to be discussed in this chapter: ‘by writing thithaways end to end and turning, turning and end to end hithaways writing and with lines of litters slittering up and louds of latters slettering down’. The hen discovers a tea-stained letter and ‘a quite everywaylooking stamped addressed envelope’. ‘The writer’s hand’, holding a quill, represents the ‘notesnatcher’, Shem the Penman. This tale, told by Shaun, is based on the fable of The Fox and the Grapes. The Mookse is represented by Pope Adrian IV (Nicholas Brakespear, or ‘Bragspear’), the only English Pope. He is sitting on a stone, ‘pompifically’. He finds the overripe gripes (grapes) wrapped around a tree by the edge of a ‘boggylooking stream’. Above them is Nuvoletta, as a cloud on a balcony, spraying mist: ‘Nuvoletta in her lightdress, spunn of sisteen shimmers, was looking down on them, leaning over the bannistars and listening all she childishly could’. 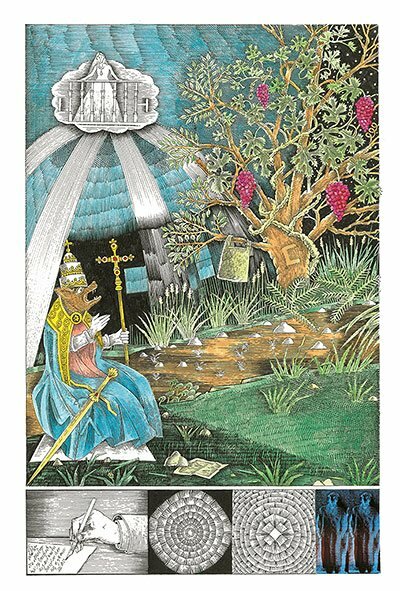 The fable is essentially about the conflict between Catholic and non-Catholic churches, with the Mookse as Pope and the Gripes as anybody who will not submit to the Pope. The Gripes is also a representation of Shem, with Shaun as the Mookse. Their arguments descend into insults, and the two arguers eventually metamorphose into an apron and a handkerchief on the bank of the river Liffey. This illustration is mostly based on the Latin episode when Shem mixes ‘ink’ from his own excrement and urine and ‘through the bowels of his misery’ he writes ‘over every square inch of the only foolscap available, his own body’. It appears that whilst Shem prepared the ‘ink’ he chanted ‘fermented words’, possibly ‘Lingua mea calamus scribae velociter scribentis’, which is from Psalm 45:1, ‘My tongue is the pen of a ready writer.’ This is represented in my version of a twelfth-century psalter illumination from St Albans. 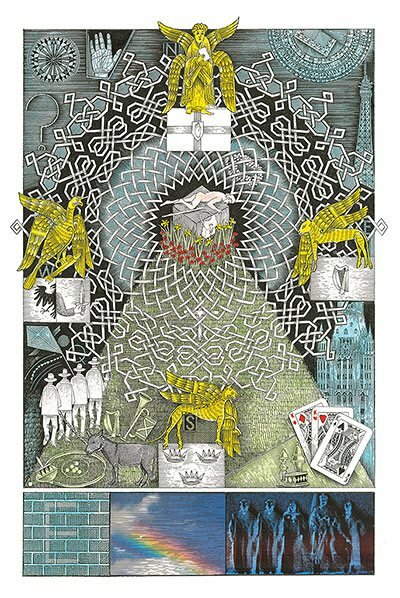 The expression ‘fermented words’ could of course be alluding to the text of Finnegans Wake itself, having the same initials as well as being something of a description of its text. Here we can see the two washerwomen gossiping about Earwicker and Anna Livia Plurabelle by the banks of the Liffey. The river expands into a map of Dublin Bay, thus illustrating how the women become further apart from each other during the course of their gossiping. Bats fly above them (‘The chittering waters of. Flittering bats, fieldmice bawk talk’), and salmon are swimming in the river, a recurring theme throughout the book: ‘like any gay lord salomon, her bulls they were ruhring, surfed with spree’. Below the moon, a few stones can be seen on the sheet below the large rock, representative of the transformation of one of the washerwomen and symbolising the static state of permanence. ‘I feel as heavy as yonder stone,’ she says. A butcher’s apron hangs from the smaller tree; a tree that represents the transformation of the other washerwoman, symbolising growth, movement and eventual death. ‘I feel as old as yonder elm,’ she says. This is closing time in the tavern: the landlord, Earwicker, has drunk his customers’ leftovers, sucking up ‘whatever surplus rotgut . . . was left by the lazy lousers in the different bottoms of the various different replenquished drinking utensils’. Earwicker’s manservant, Sackerson, holds the key to the tavern door: ‘Ere the sockson locked at the dure. Which he would, shuttinshore. 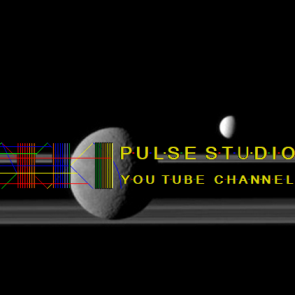 And lave them to sture.’ Finally he calls out, “Tide, genmen, plays’. The group of customers ‘all pour forth’ from the tavern. Each of the four singing old men (‘the fore olders’) are walking out of the frame in different directions: ‘North’, ‘Soother’, ‘Eats’ and ‘Washte’. 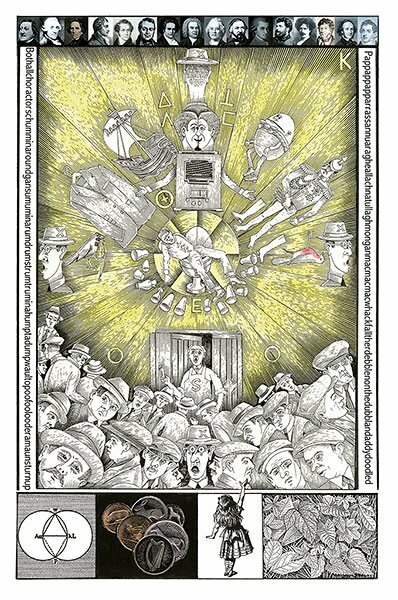 There is a strip of sixteen composers’ portraits across the top of the illustration, brought into the text in the form of wordplay. The first three, from the left, are Rossini (‘rosescenery’), Haydn (‘haydyng’) and Meyerbeer (‘mere bare’). This chapter, a dream experienced by the drunken Earwicker, takes place ‘whilst the stars shine bright by she light of he moon’. Tristan and Isolde are ‘kiddling and cuddling’ as they sail away from the aged King Mark of Cornwall (‘Kram of Llawnroc’). Above them, mocking seagulls are crying out: ‘The winging ones, overhoved, shrillgleescreaming. 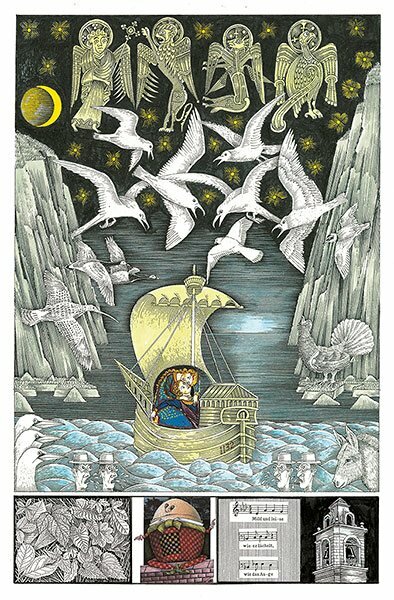 Seahawk, seagull, curlew and plover, kestrel and capercailzie.’ The four old men, among the waves with their donkey, are known as Mamalujo: in this chapter Matt Gregory, Marcus Lyons, Luke Tarpey, and Johnny MacDougall. In another guise they hover at the top of the picture as the four gospels (‘gastspiels’), represented here in a similar way to their appearance in the Book of Kells. They spy on the lovers, having much to say but only little of value, ‘all their mouths making water’. 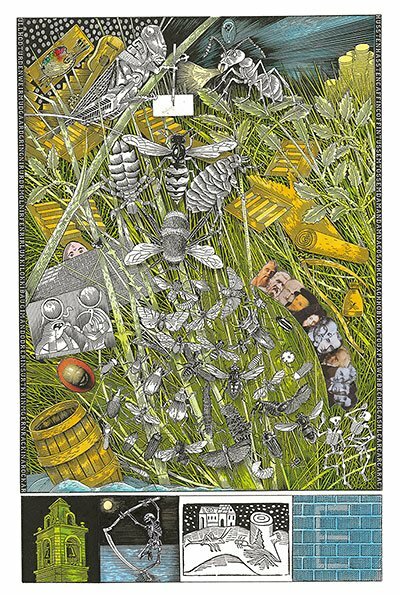 The Ondt and the Gracehoper is based on the well-known fable, The Ant and the Grasshopper. Shem is the Gracehoper (represented as an artist, author, painter and musician – wasting his time), and his brother Shaun is the Ondt, the practical businessman for whom money matters most. Attributes of the artist (easel, guitar and pen) surround the Gracehoper, whilst the Ondt is coughing and asking questions, with his hoard of cash situated behind him. In the end Shaun falls into a barrel, which rolls backwards into the river Liffey. Some of the philosophers mentioned in the text have also been incorporated into the illustration: Confucius, Melanchthon, Aristotle, Schelling, Plato, Schopenhauer, Vico, Kant, Maeterlinck and Leibniz. Wyndham Lewis, who is also mentioned, is between Kant and Maeterlinck. Shaun has now been ‘metandmorefussed’ into Yawn: ‘Pure Yawn lay low. On the mead of the hillock he lay, heartsoul dormant mid shadowed landshape…’ He is put through an inquisition by the four old men, accompanied by their donkey, who hold a ‘starchamber quiry’ over his character. 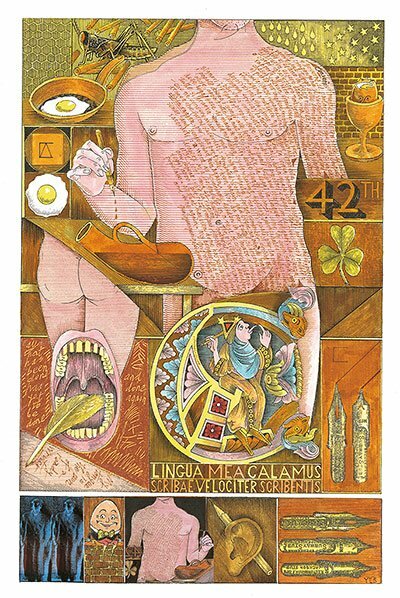 The ‘Mamalujo’ are represented on the four sides of the illustration, as the four symbols of the Evangelists (based on how they appear in the Book of Armagh). The four ‘apostles’ are also ‘quartermasters’, standing for the four provinces of Ireland (here depicted by their flags). They cross-examine Yawn about the fall of his father, Earwicker. Later Yawn seems to become HCE, boasting about his feats, as well as his accomplishments as a builder. The interlacement design is based on one by Leonardo da Vinci, and represents the ‘spreading abroad’ of the ‘drifter nets, the chronies, gleamy seiners’ nets’ by the four inquisitors. Anna Livia Plurabelle’s face merges with the sea as she delivers her monologue at the end of the book. 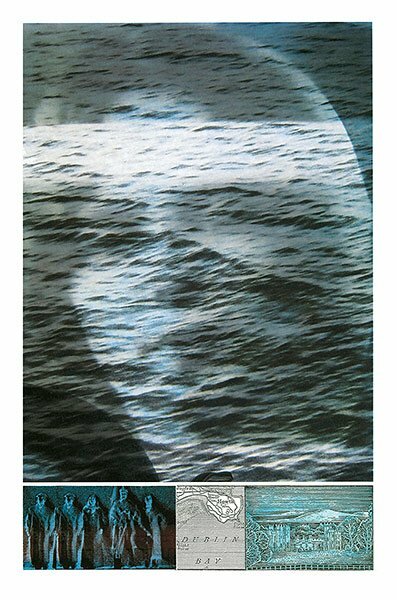 She is a personification of the river Liffey, which flows, as a dissolving dream, into the vast ocean at the dawn of a new day. ‘This baylight’s growing,’ she says, hence the strip of light across her forehead. After a sequence of drawn illustrations we now have an image based on a photograph in order to indicate wakefulness and reality after the dream. The photograph is of Nora, Joyce’s wife, an inspiration for Anna Livia Plurabelle. Anna’s last line of the book is ‘A way a lone a lost a last a loved a long the’. This, an incomplete sentence, completes itself at the very start of the book as ‘riverrun, past Eve and Adam’s, from swerve of shore to bend of bay, brings us by a commodious vicus of recirculation back to Howth Castle & Environs’. The book finishes where it began; the endless cycle of time goes on. Posted by world.pulse on 20. March 2016.. Filed under James Joyce,Literature. You can follow any responses to this entry through the RSS 2.0. Both comments and pings are currently closed.